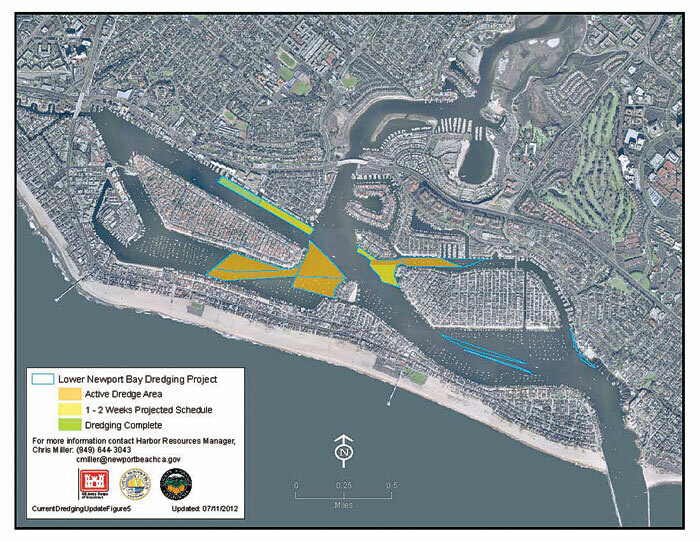 NEWPORT BEACH — Newport Beach City Council members voted unanimously July 24 to approve additional funds for Newport Harbor’s Lower Bay dredging operation, bringing the project total to $10.4 million. The project will remove more than 550,000 cubic yards of sediment in the process. The joint dredging project cost is being split by the Army Corps of Engineers, the city of Newport Beach and Orange County. “This is the culmination of a lot of very hard work over many years,” said Councilmember Mike Henn. “It will result in the spending of roughly $15 million over the course of a year or so, for dredging in the lower bay that will accomplish major environmental cleanup through Rhine Channel — and the removal of other unsuitable sediments throughout the harbor. “In addition, we’re providing navigability for all but the deepest keelboat through the entire harbor.” Henn said. The first phase currently under way was covered by $3.87 million from the Corps of Engineers, $2.5 million from the city and $639,000 from the county — which will initially be covered by the city and paid back at a later date. Phase 2, which is expected to begin following the completion of Phase 1, will be funded by the city’s additional $3.8 million allocated for the project, along with an expected $779,000 from the county. The Corps of Engineers is responsible for dredging federal navigable waterways in the harbor, but budget constraints over the years have prevented a major dredging operation in the lower bay. With an unexpected $2 million allocated for the 2012 fiscal year, Newport Beach city officials jumped at the opportunity to utilize dredging funds, creating a joint project with the three agencies to benefit the harbor. In addition, getting the opportunity to dispose of more than 100,000 cubic yards of contaminated sediment at the Port of Long Beach’s Middle Harbor fill site, thanks to the ongoing Middle Harbor Project, allowed for the removal of polluted sediment from the bay without having to truck the spoils inland at a much higher cost. The approval of additional funds brings the city’s contributions to harbor dredging to more than $10 million, between the Lower Bay’s two phases and the 2011 Rhine Channel dredging project, in which more than 90,000 cubic yards of contaminated sediment removed from the harbor. When the project is complete, Newport Harbor will be rid of nearly 90 percent of tested sediment that has been deemed unsuitable for ocean disposal. So far, the Port of Long Beach has accepted more than 75 percent of the 108,000 cubic yards of sediment marked for disposal at its landfill. The new land created from the fill material will be used to create a modernized shipping terminal at the port. The $950 million Middle Harbor Project has been accepting sediment from surrounding harbors to fill in a 54-acre water area, and it is nearing capacity. Newport Harbor Resources manager Chris Miller reported that after a short closure to assess its landfill site, Port of Long Beach officials will begin accepting the remaining 14,000 cubic yards of contaminated sediment from Newport Beach, but they will keep a close watch on the process. A 24-hour dredging schedule was reintroduced following the port’s opening of the fill site, to try and work as quickly as possible to get the remaining contaminated sediment out of the harbor. In the project’s Phase 2, approximately 207,000 cubic yards of clean sediment will be barged to an offshore ocean disposal site, while 2,850 cubic yards of contaminated sediment will be sent to the Port of Long Beach. With Long Beach accepting sediment again, dredging contractor R.E. Staite will relocate its clamshell dredger Palomar back near the Balboa Yacht Basin in the “D” Mooring Field, to resume dredging the unsuitable sediment. Boaters with slips at Balboa Yacht Basin, Basin Marine, Promontory Bay and 919 Bayside Drive, as well as a few slips in the California Recreation marina, should be aware that access to and from slips may be limited during this time. R.E. Staite’s smaller dredge is currently being serviced in San Diego, and it should return to help out in Newport dredging activities later this month.